In New York, two top legislators will soon be reporting to prison. Virginia's former governor is trying to avoid two years behind bars. Meanwhile in D.C., despite similar conflicts of interest, Jack Evans is cruising to reelection for a record-breaking seventh term on the D.C. Council. Over the course of his 25 years on the Council, the last 18 of which he's chaired the powerful finance committee, Evans has crossed bright ethical lines with impunity. In addition to his Council salary of more than $130,000, Evans makes $60,000 a year from Manatt, Phelps & Phillips, a law firm that regularly lobbies city hall. That's actually a pay cut from the $190,000 Evans used to earn from lobbying powerhouse Patton Boggs where he worked for nearly 14 years. It's unclear what Evans does for his significant second salary. Under "description of work," his latest financial disclosure offers one word: "Legal." What is clear is that Evans' position as councilmember has benefitted his firms' clients, as was the case with the recent Pepco-Exelon merger. In 2014, nuclear giant Exelon and regional utility provider Pepco announced they were merging, creating the country's largest utility. But first the $6.8 billion deal needed approval from federal regulators, four states and the District of Columbia. One after another signed off, until only D.C. was left. In August 2015, D.C.'s Public Service Commission (PSC) unanimously rejected the merger. "I'm stunned," said Anya Schoolman, who helped lead the David vs. Goliath fight to stop the merger. But Exelon wasn't done. By the close of 2015 it had spent $259 million on the merger. That investment seemed to pay off when Mayor Muriel Bowser announced in early October 2015 she was dropping her opposition to the deal, which she said now included enhanced protections and benefits for District ratepayers. Activists noted Bowser's change of heart came on the heels of Pepco agreeing to pay D.C. $25 million for naming rights for an unspecified number of streets and parks, mostly around the not-yet-built soccer stadium. The highly unusual agreement, less than two pages in length, lasts for an unknown period of time. "D.C. residents deserve to know if pay-to-play politics or quid pro quos played any role in advancing this massive corporate merger," Public Citizen's Craig Holman said at a press conference on the site of the planned stadium. 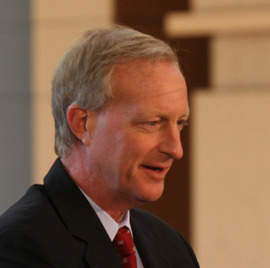 While several councilmembers had called on the PSC to reject the merger, Jack Evans wasn't one of them. In an October 16, 2015 letter, Evans and six colleagues urged the PSC to approve Exelon's takeover of Pepco. Evans didn't disclose to commissioners that he had started working for a firm representing both Exelon and Pepco. According to his financial disclosure statement, Evans' first day at Manatt Phelps was October 1, 2015, two weeks prior to the letter. In May 2015, the Council unanimously approved $250,000 to study the feasibility of a city-owned utility replacing Pepco, much to the company's displeasure. The following month, after heavy lobbying from Manatt Phelps, the Council reversed itself and voted 7-6 to divert the funds elsewhere, with Evans casting a decisive vote. "Pepco's fingerprints are all over it," said Councilmember Mary Cheh. The company's influence "runs through our entire government." This isn't the first time law firms have reaped questionable benefits by having Evans on the payroll. A 2009 Marriott hotel deal, in which the District provided $272 million in taxpayer assistance, further illustrates Evans' questionable ethics. After spending years working to put the deal together, Evans suddenly recused himself after questions about a potential conflict of interest. "We respectfully request Mr. Evans to disclose fully the reason for these recusals (including any potential or perceived conflicts of interest)," two leading D.C. civic organizations wrote in a joint letter to the Council. Evans didn't respond to the letter, but later told reporters he had no conflict of interest and was recusing himself simply out of an "abundance of caution." But that wasn't the case. "I recused myself... [because] my law firm, Patton Boggs, represents ING who are the equity partners in the private financing part of the hotel," Evans said in a 2009 email that surfaced two years later. When questioned by reporters, Evans confirmed that ING was a client of Patton Boggs at the time of the deal. ING's role was significant, allowing the developers to raise their equity stake in the project from $135 million to $320 million, Washington Business Journal reported. D.C. law requires councilmembers to file an official explanation for their recusal. When independent reporter John Hanrahan pointed out that Evans hadn't, the councilmember responded by calling Hanrahan a "f---ing idiot." In addition to failing to file his recusal, Evans effectively un-recused himself when the deal became ensnarled in a lawsuit. "Behind the scenes... [Evans] is trying to get the parties to resolve their dispute," the Post reported. Ultimately Evans succeeded in getting the deal back on track, and $272 million in taxpayer funds went to private corporations, including a client of his firm's. "[I'm] no lawyer," wrote City Paper's Loose Lips, "but when the city and developers go in on a deal together... and Evans has ties to parties on both sides, that seems at the very least like a potential conflict of interest." Then the bidding war got hotter. "Whatever someone else puts down we're going to match it and we're going to beat it," said Evans, who committed upwards of $25 million in public subsidies to lure Northrop Grumman to D.C. In the end, the Fortune 100 company ended up in northern Virginia, likely with increased public subsidies because of Evans' pledge. "For a legislator to promote legislation that would benefit his own firm's client, or the client of a closely-related firm, is the very essence of conflict of interest," wrote Hanrahan. In announcing the charges, U.S. Attorney Preet Bharara asked, "What exactly does Speaker Silver do to earn his substantial outside income?" That same question could be asked of Evans. In Virginia, former governor Bob McDonnell was sentenced to two years for trading favors with a businessman in exchange for $177,000 in gifts and loans. McDonnell has appealed his conviction to the Supreme Court, arguing that he didn't take official actions to further the businessman's interests. Evans would be hard-pressed to make a similar claim, given that on multiple occasions his official acts have benefited clients of his firms'. Dc Conflict Of Interest Northrop Grumman Marriott Washington, D.C.